Darren Clapperton breaks out on an attack for Selkirk (picture by Grant Kinghorn). Selkirk burrowed their way further into the top five of National League One after coming from behind to win Saturday’s Borders derby. In the end, they moved to within touching distance of the leading four by defeating the Maroons 17-26. Manager Tom Ramage puts it down to belief in themselves and a whole-team approach which has brought a steady string of wins in recent weeks. The Souters are also developing a bit of a tag for themselves as ‘comeback kings’ as, once more, they found themselves behind before recovering. Ramage said there was enough confidence in the side to be reasonably sure of overturning a deficit, although the defensive negligence was concerning at times. They were reasonably hopeful of a good result tomorrow (Saturday) away to Kirkcaldy. 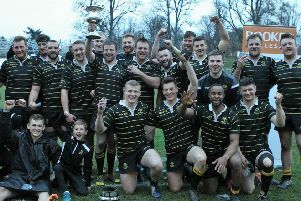 Confidence and Selkirk’s faith in their ability were to the fore again at Gala, said Ramage. “As the game went on, our forwards got further on top and allowed the backs to let loose with some of their pace and some of their guile. “We scored some nice tries – three of them from the backs, all out wide. “Three by wingers – Darren Clapperton, Henry Bithray and Frazer Anderson – and the other one a forward rollover from a close lineout, which was working really well. Ramage added: “The points are in the team when they go on the field, although we seem to have little lapses in defence. “On Saturday, it was on either side of halfway. A five-minute spell cost us 14 points. The will to come back had served Selkirk well in recent weeks, added the manager. “It’s the self-belief they have as individual players and as a unit – forwards, backs and combination,” said Ramage. “There are leaders in the team all round. Any lapses in concentration are quickly brought back under control.